There are few things I love more than a dramatic before / after and I have a good one for you today! 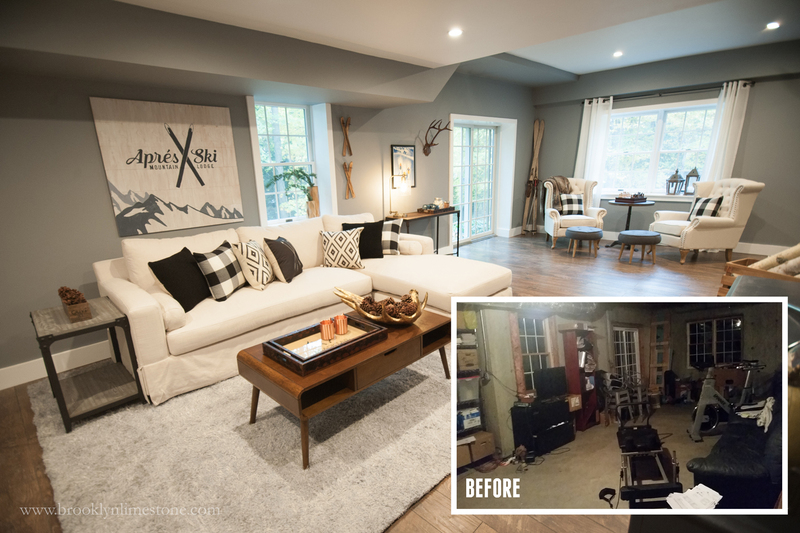 Thanks to my friends at Hayneedle, we transformed a dark, dank and general dumping ground of a storage space into a cozy ski lodge inspired family room. Hard to imagine this is even the same space! 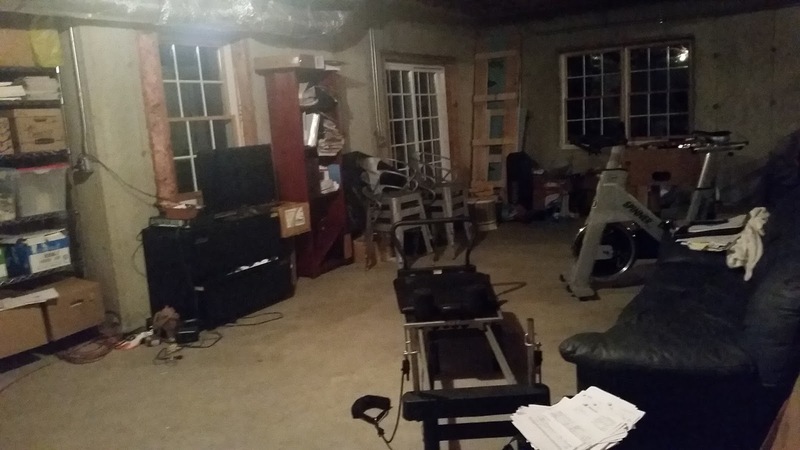 Earlier this year my friend asked for some advice on how to better use this space in her basement. 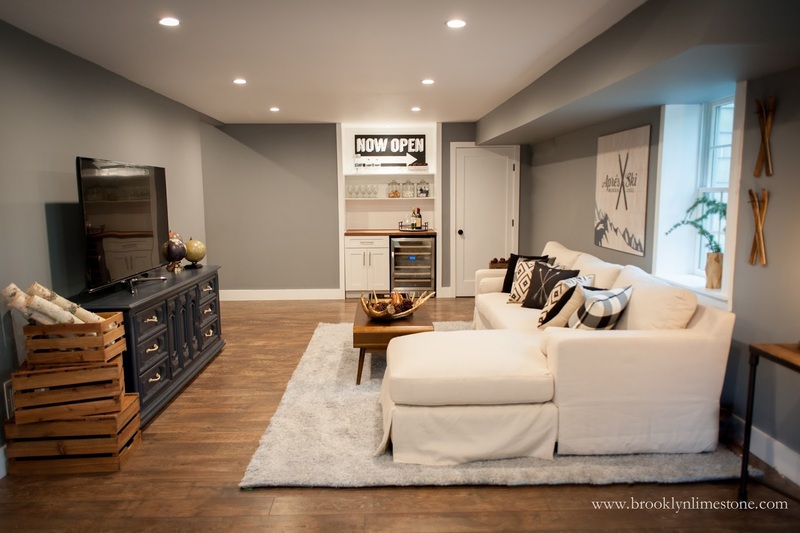 We started with the renovation - new sheetrock, flooring, trim and lighting made a huge difference but it needed some love in the form of new furniture and accessories to make it truly liveable. Thats where Hayneedle stepped in and lent a hand. 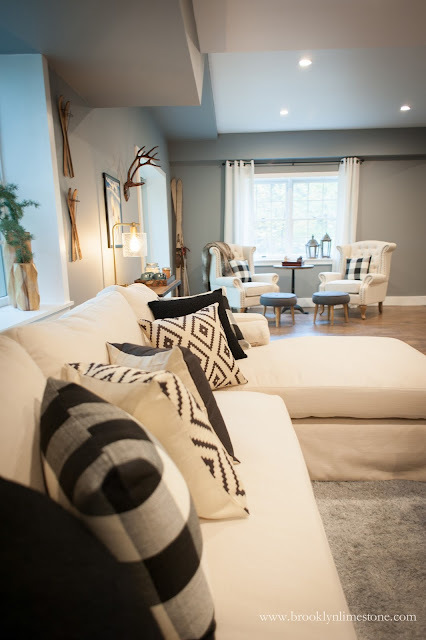 The family wanted someplace cozy to watch tv, have company over and generally just relax. 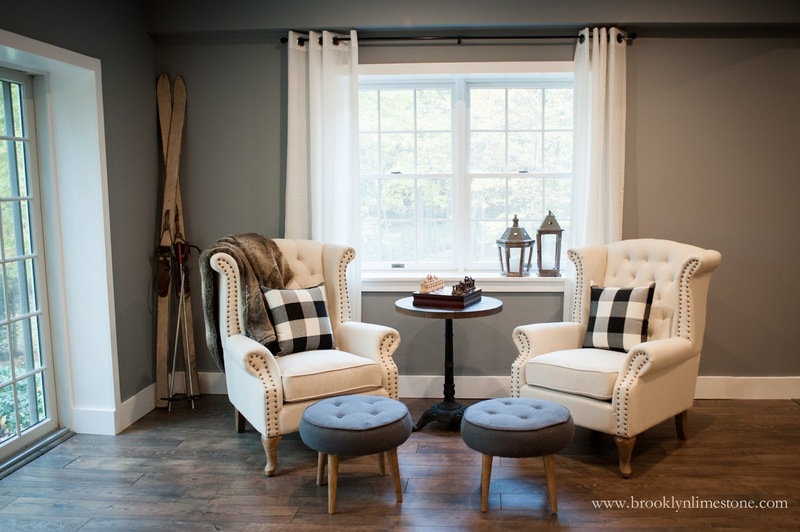 They loved to ski so a loose interpretation of a ski lounge was incorporated into the styling. Since the room was rather long, we created 3 separate zones - lounging, conversation and snacking. The design started with this sectional to allow for lots of comfortable seating. 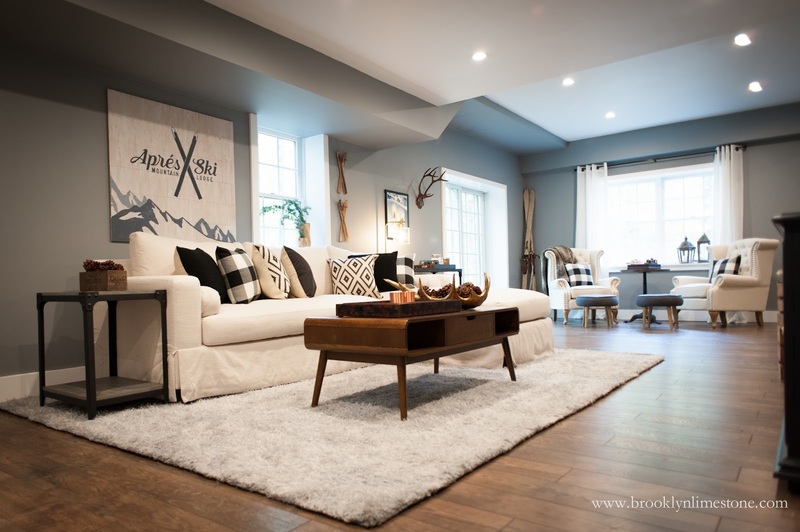 A soft rug defined the sofa area while also adding texture. The large DIY piece of artwork balanced out the asymmetrical window. The mod inspired coffee table added some vintage character to the room. 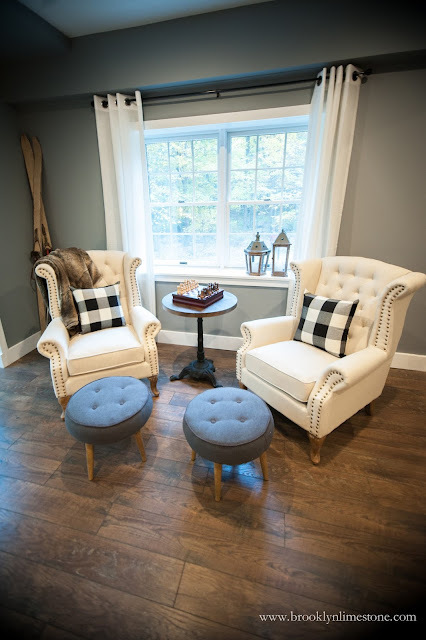 On the other side of the room we took advantage of the natural light to create a little conversation area with two fabulous wingback chairs and round ottoman stools. 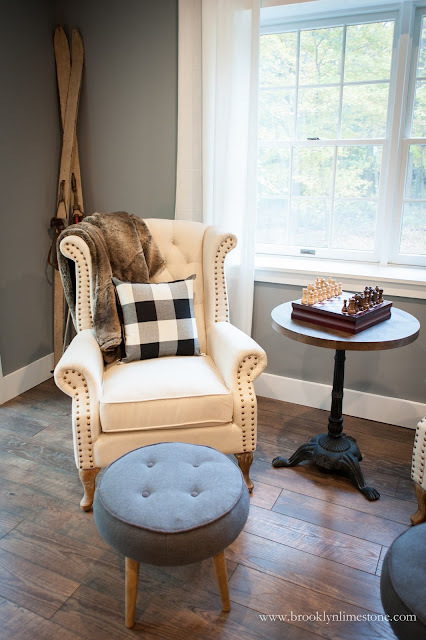 The perfect spot to read, play chess or simply sit and enjoy a mug of hot chocolate! 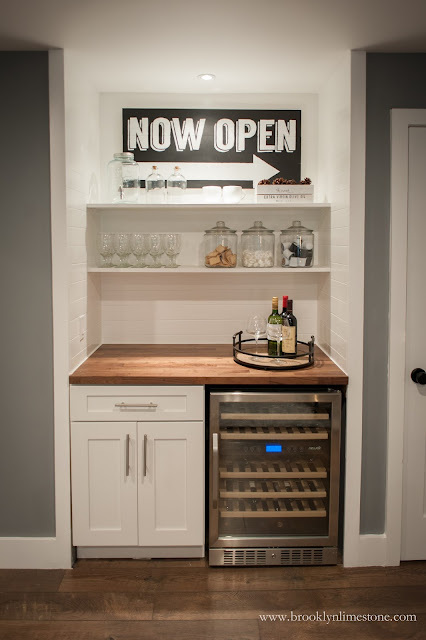 And finally on the other end of the room, we repurposed an existing closet into wine and snack bar by removing the doors, adding shelves and wine fridge. 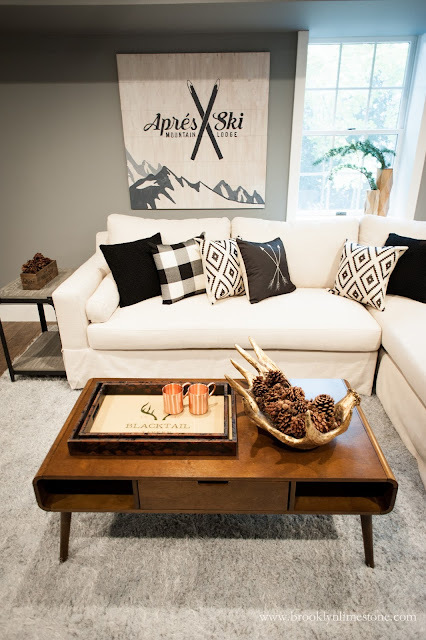 Throughout the room, we added warm little accents like lots of pillows, these fabulous metal antlers, ski lodge inspired trays, vintage looking crates and a moose antler bowl. 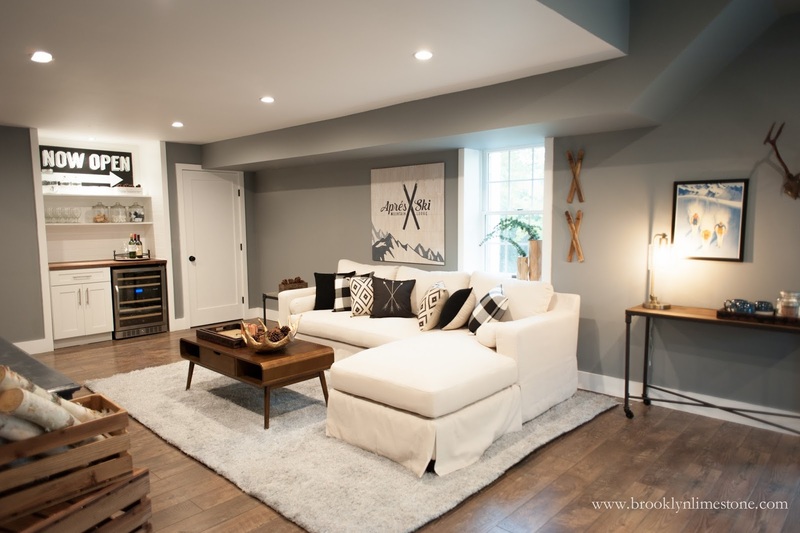 As a home blogger, it's easy to get caught up in the pretty and I think this certainly qualifies but what's more, this room will be a space where a family will make lots of happy memories for years to come! I loved being a part of creating that and I hope it's inspired you as well.  Shop this room at Hayneedle. Pretty and functional! And now I want to go on vacation. Let it snow! Thanks Mindy! I love it too. It's a DIY piece. After designing it on the computer, the image was blown up, traced onto a large wood panel and filled in with paint. I'm happy to share the file if you want to do it yourself. It's a little time consuming but can easily be done in an afternoon and in any size! We are a huge ski family as well! 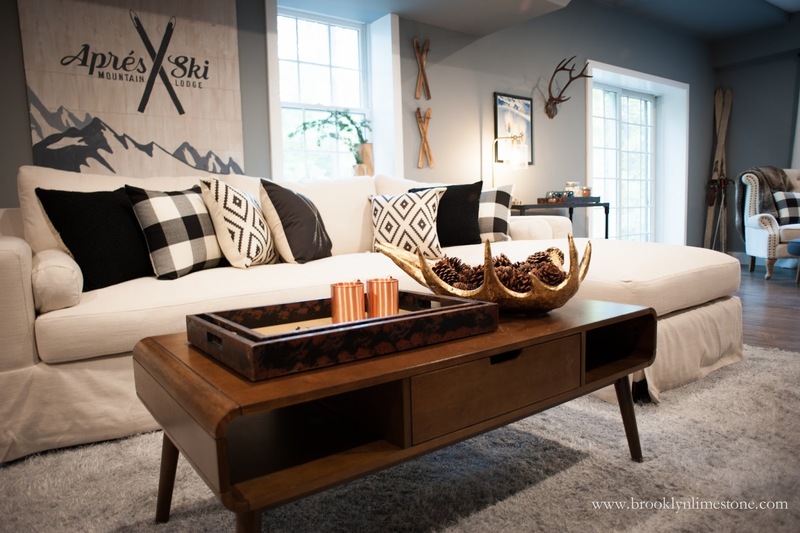 As soon as I saw this room I was hoping you would link the ski art! I'd love to try and recreate it! Beautiful room! You did a GREAT job!!!! As you always do!!! Brava!!!! It looks great! Thank you so much! I'm really proud of this space so your kind words mean a lot. Super room, love it. What paint color is that? Huge transformation for the better. A home run for sure. 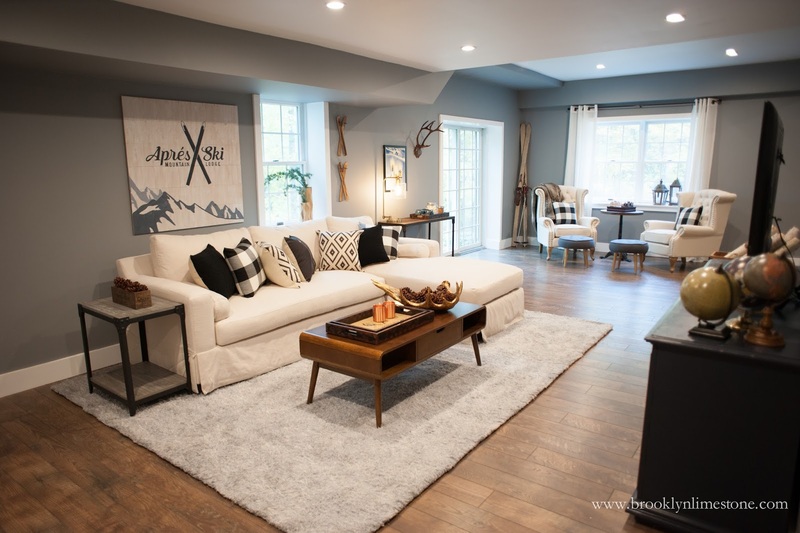 Love what you helped create, this room is not only beautiful, it looks very welcoming and functional. I love the transformation! Thanks so much Lori. You are so sweet! I love this!!!!! What color white did you use? Stunning! What kind of flooring is that? It's exactly what I'm looking for to use in my finished basement.